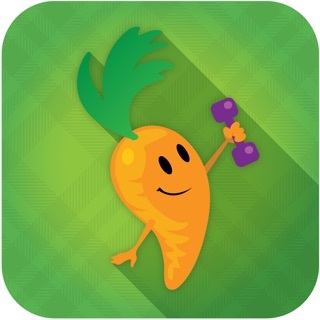 Important note: Please be aware that the main focus of this App is on balanced portions by food group and keeping track daily portions consumed. Make sure to swipe the scroll bar on the right to show more exchanges for the food group that you are looking at. 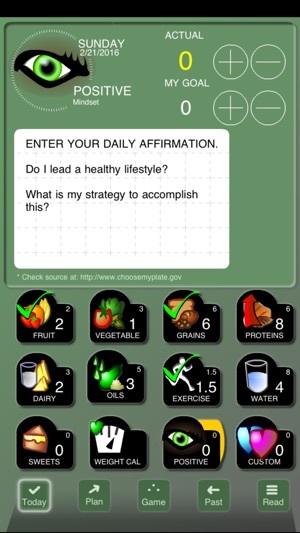 Introducing Checkoff Diet Tracker With Visual Exchanges, a simply presented diet app. with exchanges in food groups. Set your daily goal and track your consumption by food group. This app. keeps it simple, yet you may track portions by food group, hydration, weight, motivation, exercise and other areas you may want to customize. 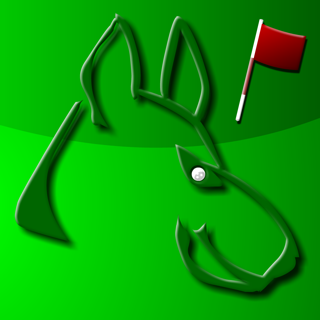 - Additionally a completely custom category is available. For example vegetarian options etc. 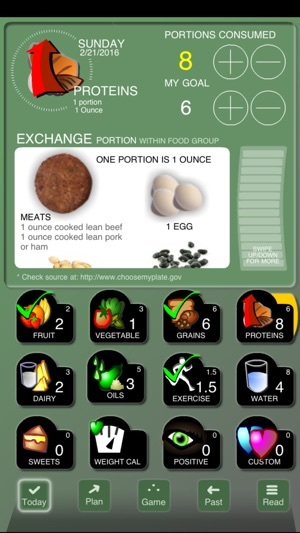 - Information from sources such as choosemyplate.gov and other .gov resources. 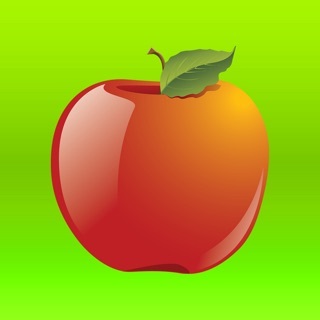 - Included, a Light Hearted game, "WAR ON CRAVINGS - Shoot the Junk Food" with popup suggestions. 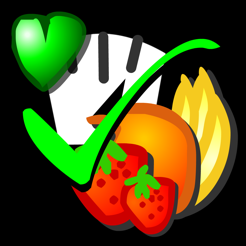 - Start by setting your goals for each food group. This is based on your age, gender and amount of daily exercise. Always consult a professional. - Then simply add the portions as you consume them. Data is saved automatically and will change on a new day. - Use the "Past" button to view and edit previous day consumptions. 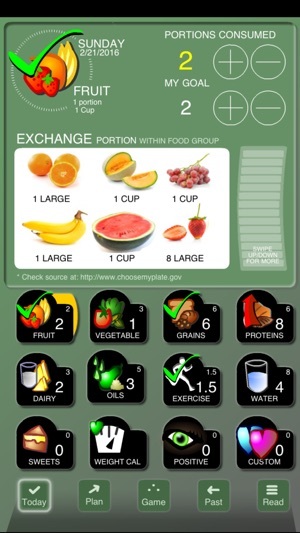 - For each food group use the EXCHANGE portion within the food group to get an idea of substitution for each portion. Swipe up and down to scroll through the content. 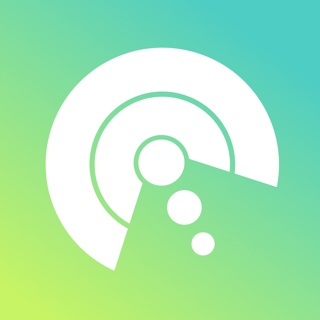 - To customize any category , in the top panel, double tap on the name of the group and type the new name. You may also do that to the description below. - Keep track of weight and calories by selecting the box item, then using the + and - buttons to increase or decrease the amounts. 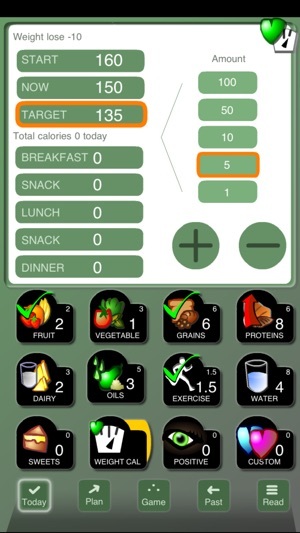 Added food and calorie database search: Although the app focuses on food group portions and fulfilling your goals, a free-form keyword search has been added to display calories. 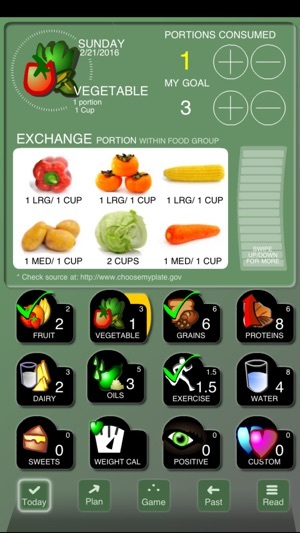 The data content is accessed from the USDA nutritional database (source information is provided in the app). If large numbers of searches are performed, the database may be inaccessible temporary based on the supplier usage policy. 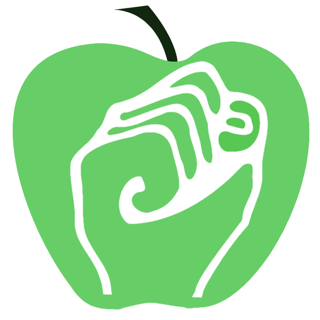 For best results use keywords such as "Apple, raw". IMPORTANT: Use the Slider on the right to swipe and release to scan your results. The database panel will show when you tap on the Scale Icon. Additionally, you can tap the large icon on the top-left for any food group to display the database panel. This is exactly what I have been looking for! If I could have I would have created this one myself. Quick to use as soon as you set up goals. I don't need calorie count. Similar to the old Weight Watchers, My Plate or Diabetic Diet. I think Richard Simmons had something similar with cards. This is so much simpler. If I could have I would have created this one myself. I wish there was a way for my iPad and iPhone to sync. Also wish I could add a some more custom weekly or daily goals. If you could do that it would be even better. 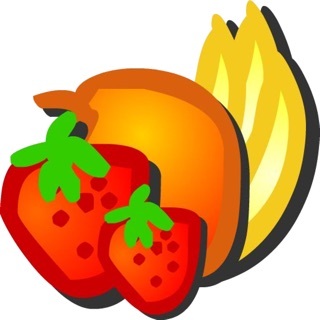 I would like to be able to have separate goals for starchy vegetables and high vitamin C fruit. I would like a goal on how many times a week for beans and perhaps red meat. 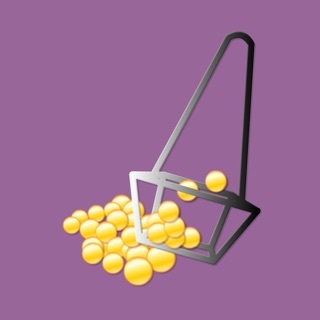 The app is great for tracking the different food pyramid portions eaten. It would be nice if you could press one button and it could tell you a summary of how much food you have left to eat for the day in the different categories. - One carbohydrate exchange, equals 15 grams of carbohydrate. - One meat exchange equals 7 grams of protein. This info could be added to the search function for looking up information on foods. 1 portion of protein equals 1 ounce in this app. That means I’d have to track 36 portions of protein every day to account for 6 meals with 6 ounces of protein in each. Same with carbs. Fruit portions are measured in cups for some reason, it would be much easier to track 1 piece of fruit (apple, orange, banana, etc.) as one portion. It also gives a one size fits all table of how many portions someone should eat, regardless of activity level. Great concept, poor execution.